For My 25th Birthday, I’d Really Like My Voice Back. And Maybe Some Cake. Actually I’d Settle For Just Cake. Man, I really like to talk. Like, really. I guess this is one of those “don’t know what you got ’til it’s gone” situations, because my voice has been pretty much nonexistent and/or unrecognizable since Saturday night. I wish I could say it was from doing something fun like finally telling off Stamos or rocking out at an Appetite For Destruction show, but I truly have no explanation for where my voice went. My friend Jeff suggested that this was God’s way of telling me “to shut yo’ mouf.” Indeed, Jeff. Indeed. The other night a friend called to discuss the latest Project Runway and instead of putting my two cents in, all I could do was hoarsely laugh in agreement/frustration. When I woke up this morning I sounded like Gollum. Tomorrow I will probably sound like my dad. I call that progress. Oh, and, as I write this, I am dealing with a serious bout of inexplicable nausea. I don’t want to go into too much detail about that on a baking blog, because, well, gross, but let’s just say that my fellow commuters are very lucky that I was able to woman up and stay strong during this morning’s rather rocky subway ride. Blech. So I’m not feeling super fantastic. Plus, I’m turning 25 in a couple of days, so I figured that instead of putting myself to work this week, I’d kick back and gorge myself on sweets made by the hands of other, more experienced bakers, like those of Butter Lane, easily the best cupcake shop you will ever experience. And I’m not just saying that because I recently won a dozen free cupcakes from them for answering a trivia question correctly (OMG. YAY). To get serious for a hot minute, the place pretty much brought me back to my love of baking about a year ago. More on that another time, in a more in-depth post. This was a birthday present from Sylvapotamus a couple of years ago. 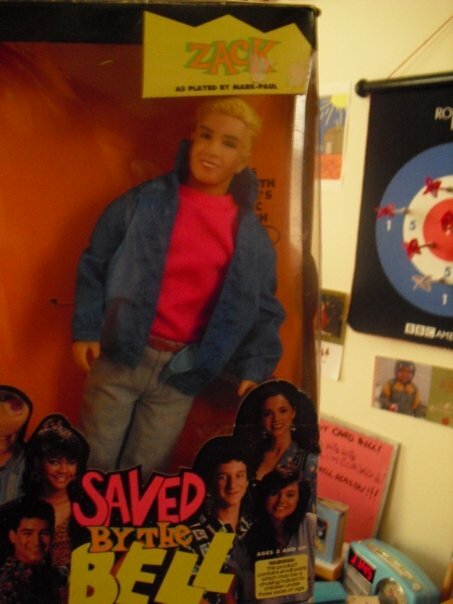 It is also possibly the best present I have ever received. Anyway, I always get a little sad around my birthday. I don’t have a concrete reason for it, usually, but there is this weird, fortunately brief, seasonal moodiness that seems to like to always pop up around the beginning of October. This year it lasted for an hour, during which the emotional half of my brain got, um, emotional, and the zombie half of my brain, sensing Sad Shibow, got ready to bake like crazy. Coffee and doughnuts crazy. Yes, dear readers, there lives the Coffee and Doughnuts Cake, which, as the creator so brilliantly describes, tastes “like a muffin and a doughnut holding hands.” Um, yes, please. 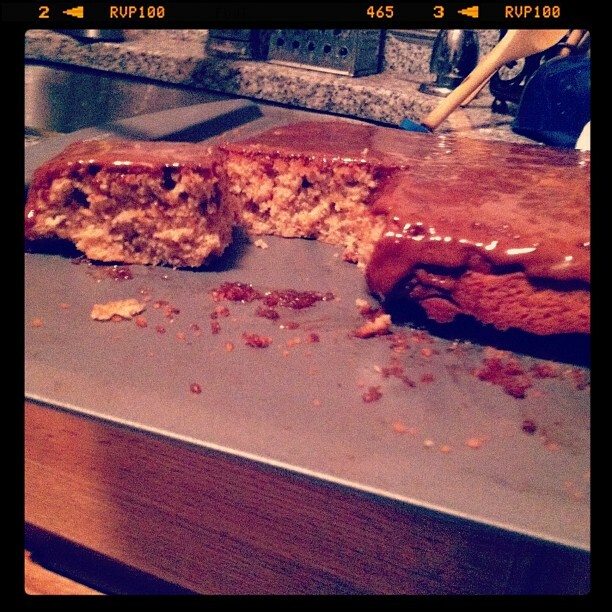 Now, there are a few steps to this cake, including a cinnamon-sugar coating and an espresso glaze. This statement may deter you from making this cake, but I beg you to go into the doughnut-shaped light. Go, and don’t ever look back. You can use a bundt pan for this cake, but I just used a 9×13″ pan because I like rectangles. Also because I don’t have a bundt pan. Grease whichever pan you decide on with a tablespoon of butter and preheat your oven to 350°F. Meanwhile, in a medium-sized bowl, sift together your flour, baking powder, baking soda, salt and nutmeg, and set aside. In a separate larger bowl, using a hand or stand mixer, beat together the remaining 4 tablespoons of butter, oil and sugars. When mixed, beat in your eggs one at a time. 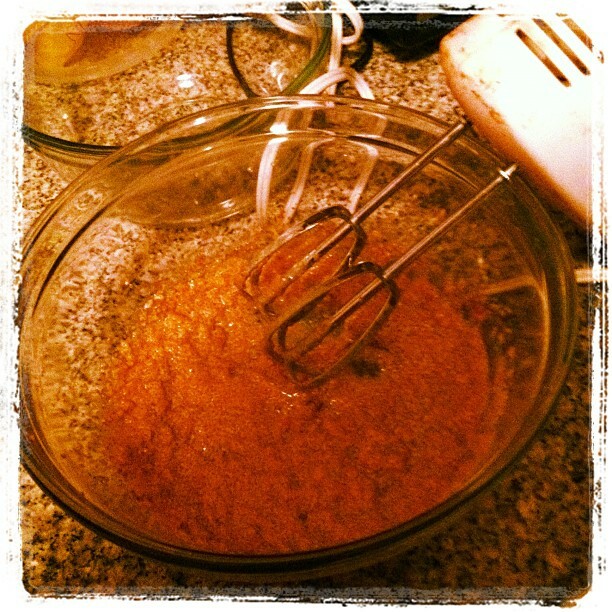 Now, with the mixer on low, start putting in the flour mixture, alternating with the milk. Once all your ingredients are in, you can increase the speed on your mixer until the batter is fully combined. Add the vanilla and beat this thang ’til it’s beaten. Pour the batter into your pan, spreading it evenly. Bake for 30 to 35 minutes, rotating the pan halfway through to ensure even baking, and then remove and let cool for a good 10 minutes. In the meantime, let’s work on our cinnamon sugar coating. Combine all of the ingredients except the butter in a small bowl and set aside. Meanwhile, when your 10 minutes of cooling time is up, start to brush the bottom of the cake with the melted butter. Then invert the cake onto a baking sheet/plate/some other flat surface and brush it all over with melted butter. (Now, what, I ask you, would you NOT want brushed with melted butter?) 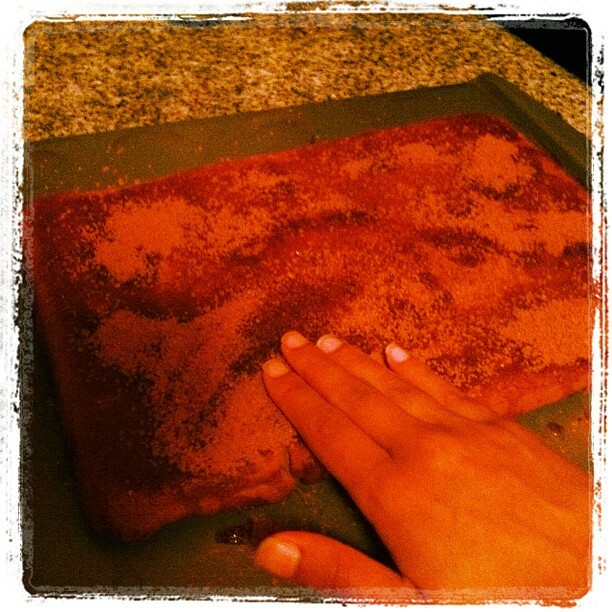 Sprinkle your cinnamon sugar over the cake and mix in with your fingers. I really enjoyed doing this. Yeah. I REALLY enjoyed doing this. Once the cake’s completely covered, send it into the fridge to cool completely, about an hour. Since I am impatient I used the freezer and cut my cooling time in half. I highly recommend this process. Either way, while it cools, you can work on your espresso glaze. Heat the milk in either a saucepan over low heat or a small bowl in a microwave for 30 seconds. Stir in the remaining ingredients until you have a thick, coffee-scented glaze. Pour over cooled cake, spread evenly, and serve. And serve. And serve. Now, I’m not going to lie: I was skeptical of this cake. The entire time I was making it I had an eyebrow raised and a backup plan (cookies) ready to execute. I guess the batter by itself didn’t seem terribly special to me, the cinnamon sugar on its own was sort of eh, and that espresso glaze was just incredibly strong. I was afraid this would be a failure. But let me tell you people something, and let me speak honestly because I like you: this finished product is one big pan of YES. After a night in the fridge, it’s an even bigger pan of HELL YES. Make this. Make it for your birthday, make it for my birthday, make it for Columbus Day, whatever. The outer layer has an unbelievable crunch to it that’s reminiscent of a freshly-baked doughnut, while the inside is buttery soft, just like a coffee cake should be. Fascinating, isn’t it? And completely worth the baking time. Make this. Please. If I could, I’d shake each and every one of you into making this, but luckily for you, I have no voice with which to annoy. Does anyone have a lozenge?